How often do you get angry? I mean really angry. Angry enough to want to literally tear someone’s head off. Angry enough to land yourself in court and end up with a criminal conviction were you to follow it through. And why? Road rage? The neighbours? Work colleagues? Your football team? From time to time we all get angry. Some people handle their anger better than others. Sometimes it’s a matter of retaining control. But once that red mist descends it’s nigh on impossible to do so. I have a bad temper. Perhaps it’s my French/Turkish heritage or something in my upbringing – I don’t know. What I do know is that when my temper flares up it has the potential to be very destructive. There was the time I chased a car round a car park and confronted the driver because he gave me a two-fingered salute. On another occasion when I was badly cut up at a junction, I accelerated in front of the car, slammed on the brakes and squared up to the driver. On both occasions I had my wife in the car – what the hell was I thinking of? Perhaps that’s the point. I wasn’t thinking, I was simply reacting in a way I’d almost been conditioned to. Once you get into that state, the only thing that prevents you from following your actions through to their logical conclusion is luck. The luck that you haven’t actually hit someone. The luck that they haven’t hit you or worse. The luck that no-one has called the police. But sooner or later you run out of luck – just ask one of the many thousands in prison for assault, ABH, GBH, manslaughter or murder. Some years ago it hit me that if I could see 10 seconds into the future, I wouldn’t react the way I do. Why? Because if I react to a situation and 10 seconds later I’m in real trouble, my initial actions are wrong. And if I don’t react to a situation and 10 seconds later nothing adverse has happened, my actions are correct. Either way, I gain by not reacting to a situation. Just to clarify, I’m not suggesting that you should count to ten given a possibly confrontational situation. That’s not the idea. What I am advocating is that given the choice between reacting to a situation or not, generally don’t react. Could the alternative be true? If I follow this ten second rule will there be times when I need to react and don’t? Possibly. Will there be times when I react and would be correct to do so? Possibly. We have to accept that there are always exceptions to rules. But that’s the point: they’re the exceptions. Most of the time we follow the rules and find the exceptions by experience. Sometimes we have to follow our gut reactions. There will be a minority of times when you have to react – and quickly. Say you see a young child about to walk into a road. If you could see ten seconds into the future, that child may be fine. There may have been no car at that moment or a parent may have grabbed them but you can’t be sure. So you don’t think, you just react. In a situation like this there isn’t a choice. But situations such as these are rare. Think about the times you’ve been in a heated conversation and made a hurtful comment. That hurt never goes away. The person receiving it may forgive you but they will never forget what you said. They can’t. It’s just not possible. So why did you say it? To have your moment? To score points? Look ahead ten seconds. If you hadn’t made the comment, what would have happened? Nothing. No pain given, no regret incurred. I’d like to say that I follow this rule religiously but I’d be lying. I don’t. Some people count to three before saying or doing something they feel they may regret; others bite their tongue – literally in some cases. I’ve never done either and I need to change. An old friend of mine, Bernie, commented on my Living and learning blog: Vic I have known you for many many years and yes sometimes you ‘tread heavily’ but you always ‘speak the truth’. I know that Bernie meant that as a compliment but it set me to thinking: how many people have I hurt with ‘the truth’? And was it the truth or the truth as I see it which may well have been wrong. I need to apply my ten second rule to some of my comments, something I’ve started to do. I spent 10 years in commercial publishing, one of the most cut-throat businesses on the planet. It fuelled my belief that the ends always justify the means, that it doesn’t matter who gets hurt as long as the bottom line doesn’t. It was an industry that fitted me like a glove. Ten years at Jewish Care changed much of this, making me a more thoughtful person who started to understand the value of good leadership and team ethic. Without those daily constraints I need to make sure I don’t fall back into the old habits. I need to follow my ten second rule. As a qualified maths teacher, I’ve always found one-to-one tutoring more rewarding than classroom teaching. There are various reasons for this, some of which are obvious. There are no discipline problems unless you’re working with disruptive pupils. In an hour of tutoring I get an hour’s work done. And I can tailor the lesson to the pupil including changing tack halfway through if it isn’t working. What I also like is the way my students and I build relationships. I get to know them, to recognise the facial expressions, body language and tone of voice when they’re having a tough time understanding a topic. For me this is a major difference from working in a classroom. Recently I was asked to explore the possibility of tutoring someone in a different country. Great, I thought – I can fly there on the Monday and come back a few days later. Nope, not that kind of tutoring. I need to be able to tutor someone many thousands of miles away. Skype is the obvious technology to use. I’ve been using Skype for many years and find it invaluable with my US-based son. But tutoring requires more than just being able to see the pupil. I need to see what they’re writing and they need to see my notes too. Fine – use a graphics tablet (like a Wacom Bamboo or similar). Pretty cheap (around £50). Which software? I don’t need Painter (which comes bundled) or an artistic package, more like an app that’s suitable for doodling. moosoftware’s TabletDraw looked promising – in fact, James Ashenhurst (www.edukwest.com/how-using-a-drawing-tablet-revolutionized-my-online-tutoring-service) explains how he uses a system like this for tutoring chemistry. Like maths, it’s a subject that needs a visual approach. Problem solved? Not quite. To see the person I’m tutoring and their computer desktop requires two video streams. Standard Skype only gives you one video stream which is normally used for the webcam. If you want a second one you have to upgrade to Skype Premium version or use just audio for the communication. Even with the premium version, while you can see each other’s desktops you can’t interact with them. Someone suggested having a look at using an iPad with an app called Doodle Buddy. This has a sharing option for cooperative drawing. Great! Or not. The sharing feature is only supported on iPhones not iPads. But the idea was a good one – I just needed to find the right app. A bit more research led me to Jot! Whiteboard. 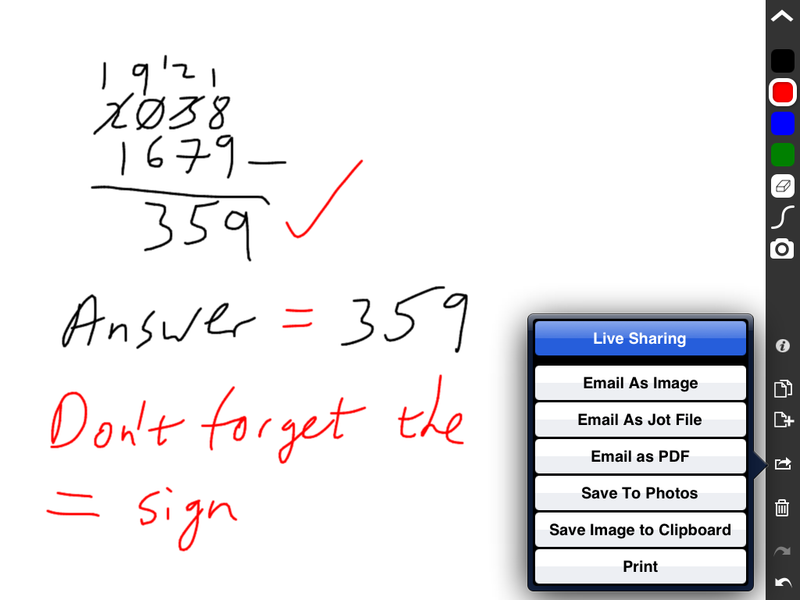 Yep – a classroom whiteboard emulation complete with colours, an eraser and other useful tools. The most important feature of this gem of an app is Live Sharing. As long as both people have the full version (which costs £2.99) you can each write/draw and have the results appearing on both iPads with almost no time lag. I use a stylus but fingers are fine. There’s an in-built camera mode for adding photos, the ability to undo and redo and various saving/emailing facilities. You can even watch the interaction on the jotwithme.com website. I’ve tried this with a few friends and the results are very impressive. Don’t you just love technology! If you could always know how the end game will play out in a situation, would you adapt your actions to get a better result? Of course you would. But hindsight is 20/20 vision – when you get to the end you realise what you could have done to change things. Sometimes. What follows is a salutary story where I’m not sure I could have. I’ve been playing guitar in bands since my early 20s and in mid-2008 I joined a decent quality band that played mainly at weddings and other functions. Over a four-year period we played almost 100 gigs and I was an integral part of the band. For instance, when the guy who ran the band, let’s call him Freddie, was unemployed for a period of time I helped out by buying some equipment and getting publicity materials printed for free. I sourced many of the music files we needed along with radio mics. I put a lot of hard work into helping to make the band successful including sorting out problems caused by Freddie’s frequent intransigence to go beyond what was contracted. “It’s not in the contract,” was a frequent comment and while I could see his point I was also aware that such an attitude could cost us work in the long run. At one gig the situation got so bad that Freddie wanted to pack up the band. I talked him out of it. When the recession started to bite a few years ago, the number of gigs decreased but the quantity was still sufficient to make the exercise worthwhile. Then two things happened in a short period of time. First, I was made redundant and then ended up jobless by January this year. Second, at the start of 2012 the band had very few gigs. I had to start thinking a bit more financially where my music was concerned so I joined another couple of bands. Even though I gave my existing band priority on date clashes, it caused a bad vibe between Freddie and I. We had three gigs in three days over the Easter holiday period which we had to play as a trio rather than the usual four-piece. Freddie was unhappy with this for while I remember one of our singers telling us she was unavailable for that weekend, he doesn’t. And the agent apparently didn’t tell the organisers of the final gig that we would be a trio. They weren’t happy with this either. A second problem was the playing time. We were contracted for three 45-minute sets but the entertainment manager told us that bands always do three 60-minute sets. “It’s not in the contract,” said Freddie rather indignantly and just sat there, frozen to the spot. So with our scheduled start time upon us we had no set list. “When are you guys going on?” asked the manager. “Give us five minutes,” I said. I then took charge, working out the first two sets with the singer and the third set during the break. Freddie took no part in this and, in hindsight, he must have felt rather embarrassed in front of our wives. His attitude towards me was rather frosty throughout the gig and while packing up. About a week later we were offered a well-paid gig for the May Day bank holiday. I was pleased to hear this especially as I’d spent a couple of days touting for work with venues we hadn’t played at for a while and agents we hadn’t heard from, all with Freddie’s agreement as I was the one with time on my hands. A problem for one of our singers led to this gig being turned down. The typical lack of good communication from Freddie, which left me in the dark as to why the singer had to turn the gig down, led to me firing off an angry email to him. Without revealing the full contents, suffice to say it questioned whether we should be turning gigs down, suggested that we should start using deps and laid out the current economics of the band. No response for two days then a short phone call sacking me from the band because of that email. When I questioned this, he intimated there were other reasons but declined to go into specifics. Should I have sent that email? Probably not. A phone call or meeting would have been better. But I have a feeling that with or without that email Freddie had decided I had to go. When I took control of the bad situation at our last gig I did more than just embarrass him: I showed up his failings as the band leader, failings the rest of us all knew about but accepted as being part and parcel of his character. It’s funny what we accept from a team leader while we’re part of that team but then question why afterwards. There had been poor communication, a frequent lack of response to emails and voicemails, and an unapproachable nature when we were setting up at gigs. It certainly wasn’t all bad. It was great to perform with the band otherwise I wouldn’t have stayed for four years but at times it was difficult and frustrating. I apologised for sending the email but it made no difference. The singer who was unable to do the gig was justifiably angry with me and I really regret hurting her; the other singer refused to speak to me citing this as a ‘business decision’. Through all of this I wasn’t in the best of places. I felt guilty about being at home while my wife went out to work each morning. I’d only just started freelancing for Mad Science and wasn’t really feeling the benefits yet. And it made no sense to turn down a big chunk of money for a gig. But none of this was taken into consideration. There was no friendly chat or warning, no latitude for my behaviour given my circumstances, just a summary execution. Given everything I had done for the band and for the various people in it, this really hurt. For months I blamed myself. That damned email. But writing these blogs has given me a much better insight into why things happen. I realise that the damage had been done before that email. When someone who likes being in control is confronted by a person who is better in that role than them, there are one of two results: they step back and let the better person take over, or they get rid of them. A few weeks ago I had a quick look at the band’s website and was stunned to see my photos on the home page, my name in the biog, my guitar playing in the demos and loads of photos of me with the band. For these items to continue to be used, my permission would have had to be sought. It hadn’t been. I emailed Freddie and asked for them to be removed. No response. No surprise there. I then contacted the website host which, to its credit, ensured that all items for which I hadn’t granted permission were removed. It took a number of attempts, including the host threatening to take the website down, but we got there in the end. It’s four months since that last gig and I have finally been able to draw a line under it. What have I learnt from this experience? Three things. 1. I really should adhere to Reinhold Niebuhr’s Serenity Prayer: Grant me the serenity to accept the things I cannot change; courage to change the things I can; and wisdom to know the difference. With one addition: the common sense to walk away when I can’t accept what I can’t change. 2. Paying into your relationship bank account by helping people when they need you is great in theory but it doesn’t always pan out in practice. 3. Never fire off an email in anger. We all do it but it rarely pays dividends. As we all get back to normal life after the hugely successful Olympic Games (cue Judy Holiday singing The Party’s Over), I’m left with a number of thoughts. When London won the right to stage the 2012 games, many of us thought that here was an opportunity to have a life-changing experience. For me it was the hope that my son would find interesting work (he was studying for his A-levels at the time but intended to do a sports & exercise science degree) and that I could take time off work to volunteer. I did apply to be a volunteer (Games Maker) a year or so ago but standing at one of the entrances and showing people where to go really didn’t appeal! Had I not been made redundant, I would never have had the opportunity to be involved at all – there’s always a silver lining! We probably all know someone who was involved as a Games Maker. In my case, it’s two people who were in the opening and closing ceremonies. A percussionist friend of mine played drums in both and my ex-manager at Jewish Care was a dancer/actor in the closing ceremony. Both put in many months of rehearsals on a voluntary basis. But what of the staff? For me it was 10 days’ work at Hadleigh Farm plus a few days’ training – hardly a huge commitment which wasn’t the case for others. Jayne was a professional nurse who had taken unpaid leave to be Hadleigh Farm’s medical manager. As such, she ran the team of doctors and nurses who cared for the athletes and handled the drugs testing – a hugely responsible role. After breaking down the medical facility on Monday she was back at her day job on Tuesday. Incredible. Some staff had been employed by LOCOG, the organising committee, for years. That made it a career move and one that would hold them in good stead for their next job. But some staff gave up their jobs to work for LOCOG for a matter of months. The technical manager, Andy, and his deputy, Ben, started work at Hadleigh Farm in March this year. Both gave up jobs to be there; both will be out of contract by the end of this week with no jobs to go to. Yes, the work at Hadleigh Farm will look great on their CVs but with over two-and-a-half million people out of work, will it make much difference? Almost everyone I spoke to had a story to tell. For instance Shelley, the control centre manager, is about to move to the Isle of Wight to set up a b&b with her partner. And many students used their summer university break to have the experience of a lifetime and to earn a few bob. I’d expected the three day break-down period to be a sombre affair with people feeling – and looking – flat but this wasn’t the case. Perhaps some of them had no emotions left after the draining experience of the race days last weekend. Whatever the reasons, most people were still smiling. Within a week or so Hadleigh Farm will be almost back to where it started some months ago. 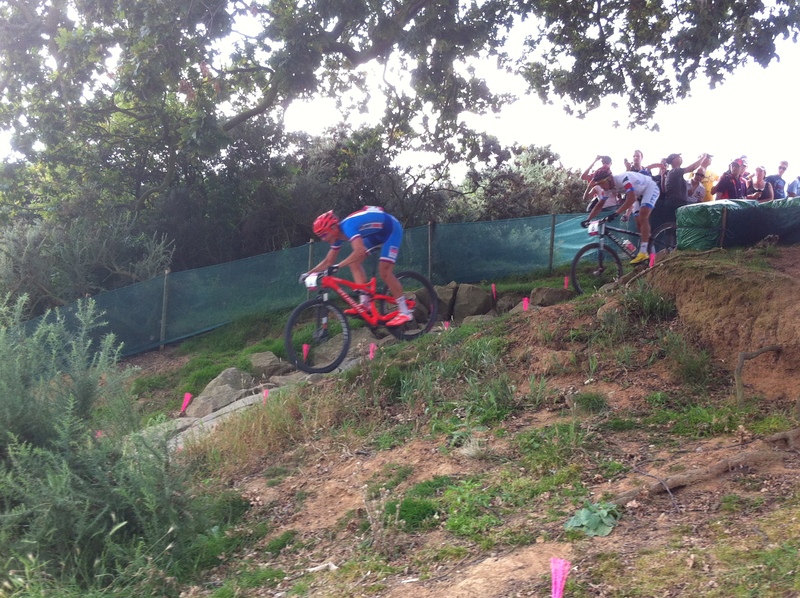 The legacy of the games for this venue is the setting up of a permanent public mountain bike course plus the possibility of having national and perhaps international championships here. But for those of us who worked there, the image of over 40,000 spectators across the two race days will remain indelibly printed in our memories. As anyone who knows me will tell you, I’m rarely lost for words. But in early May, my gob was seriously smacked! I’m not sure how long it took for my jaw to finish bouncing on the floor. That’s larger than a football pitch! “Come in for a meeting tomorrow and I’ll tell you more,” finished Mark. The job? Printing the dance floor for the opening ceremony of the Olympics. You would have seen this as the grassed areas were removed during the ceremony. It was a bit like the opening scene from Eastenders. A non-print specialist had put the artwork together from satellite photography and it was my task to ensure it could be printed correctly. It was then to be cut and glued onto the wooden platform (including five ramps) at the Olympic Stadium. 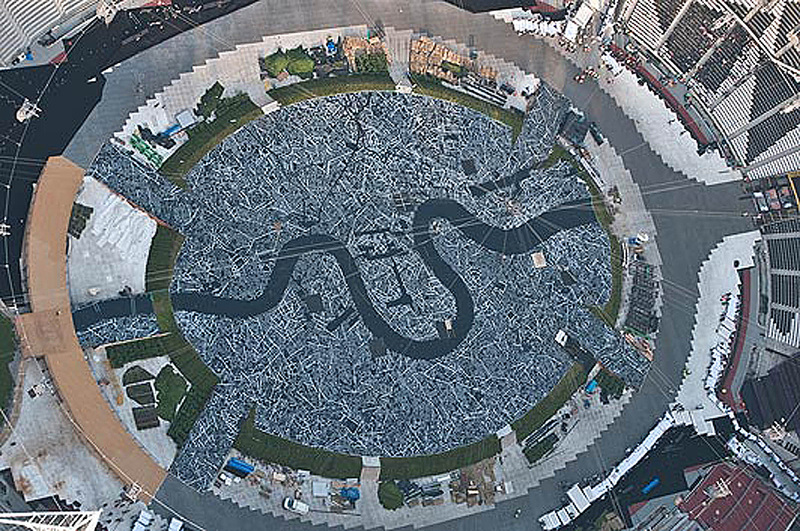 I don’t want to get too technical but suffice to say that the Adobe Illustrator-based image consisted of four layers of streets (in varying shades of grey) plus the River Thames and various waterways. That’s over 100,000 streets and in excess of a million street crossing points. Part of editing the image required me to remove the underlying part of where streets overlapped each other, layer by layer. Was I glad to have a powerful dual four-core desktop Mac! My MacBook Pro laughed at me when I tried to carry out some of the editing on it! Cleaning up the artwork to make it printable was only half the battle. It had to be divided into strips for printing. After a few tests, we worked with 412 strips, each measuring 13m by 1.5m. And as the print was onto black vinyl, a white undercolour had to be printed first making a total of 824 strips. That’s 824 PDFs, each output and checked. I won’t go into all the other problems I had but in the end it took me over 80 hours to finish the job. In terms of printing, we’re talking about three weeks non-stop, 17 hours per day. Back in March I replied to an advert on gumtree for part-time work during the Olympics. A local consultancy was putting together a team of people to handle the walkie-talkies (or radios) at Olympic venues. 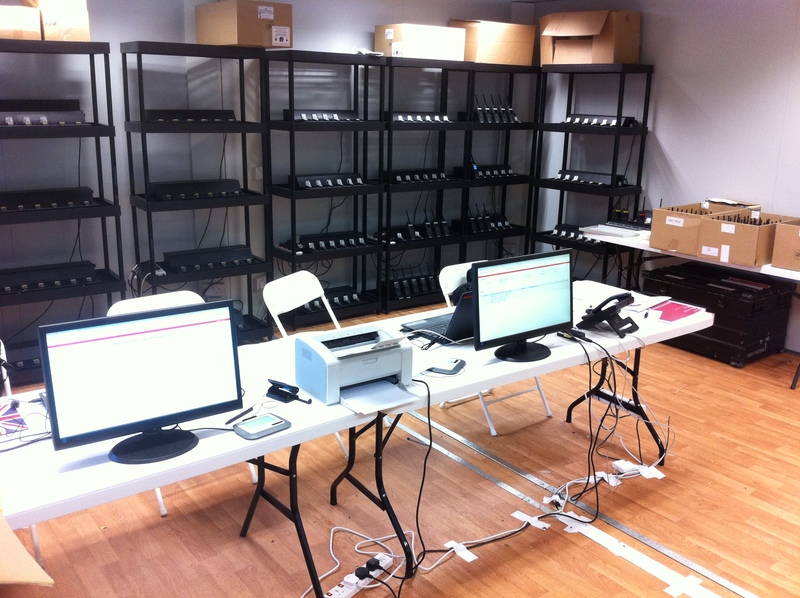 Each venue would have a Radio Distribution Room (RDR) and a shift pattern with a team leader and two volunteers. Having passed the interview, I had two days’ training with Riedel, the radio suppliers, and a day’s training wth LOCOG regarding what was expected of someone working at the Olympics. This included how to engage our volunteers (or Games Makers as they were called), one of the most important aspects of the whole exercise. Running an RDR almost didn’t happen for me. I’d been offered six weeks’ work with Mad Science and while I wanted to be involved with the Olympics, only at the last moment did I find out where I was being deployed: Hadleigh Farm in Essex. 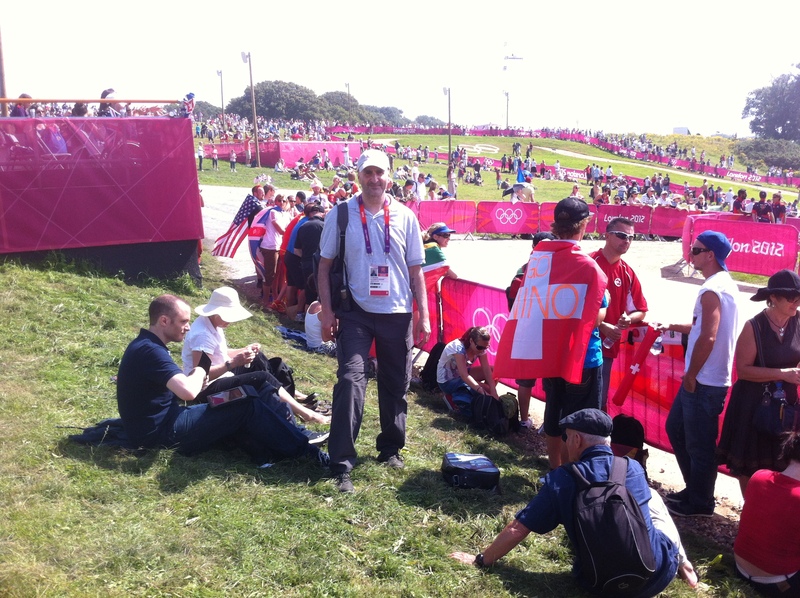 From 6-15 August I was to be a team leader at the mountain biking venue, working over 70 hours in the ten-day period. This included the set-up, race days (11-12 August) and the break-down. I’m writing this on the morning after the closing ceremony with the three-day break-down to come. I’d expected to be deployed locally at the Lee Valley White Water Centre, a 15-minute drive away. When I checked the distance for Hadleigh Farm I realised that I would cover the best part of 1000 miles in ten days! But being involved was more than just a financial decision. I remember the moment seven years ago when the London bid was successful and decided there and then that I would have some involvement in the greatest show on Earth. 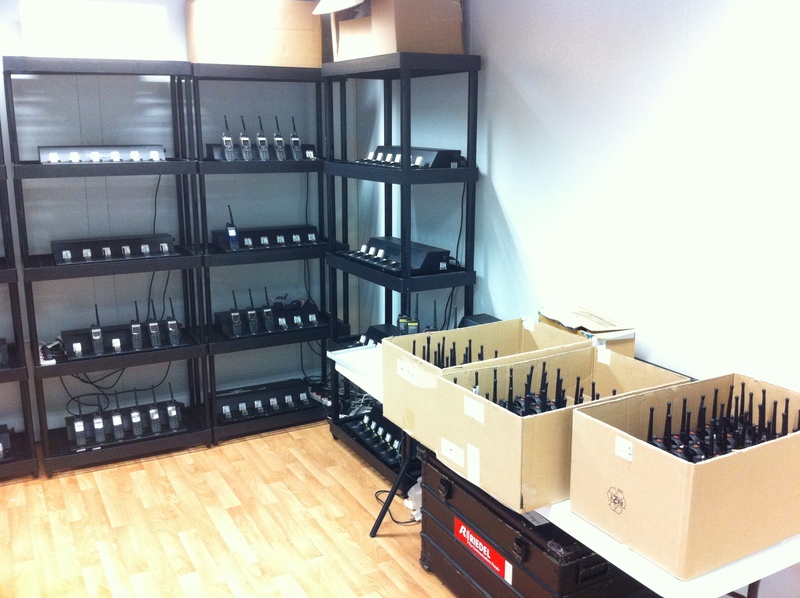 Riedel was responsible for around 18,000 radios throughout the venues, a huge financial commitment. A big part of my job was to ensure that all radios and extras were booked out and then booked in at the end of each day or longer hire period, checked for damage and any incidents reported. It sounded like a boring admin job but life is what you make of it – and so was this opportunity. Efficiency was the key. Each day we prepared boxes of radios to go out early in the morning. These were returned daily, checked, batteries changed, and re-boxed for the next morning. I took the early shift and my counterpart, Adam, the second one. We were helped by two fantastic volunteers, Malcolm and John, who were useful in a number of ways – including repairing our printer, setting up the PC ad hoc network when it ‘disappeared’ and supplying my Mac with broadband courtesy of Malcolm’s giff-gaff mobile phone! I was really impressed by how we were appreciated. Each day we were paid visits by the venue control and technical managers who told us what a great job we were doing. Everyone smiled even under pressure. Being part of the Olympics rubbed off on us all. It wasn’t all plain sailing. Problems included an 11-hour set-up, much of which was spent tracking down radios that had been given out in the weeks before our arrival, getting the frequent inventory checks to tally, and understanding the quirks of the various bits of equipment. Sometimes we were like swans – calm on the surface and paddling like merry hell beneath! But in the scheme of things, nothing really phased us. I’ve always found that being pro-active is the best way to prevent problems from occurring. On race days we patrolled the course with spare batteries to replace failing ones. This also gave an opportunity for each of us to enjoy the atmosphere and to savour this moment – plus great photo opportunities! 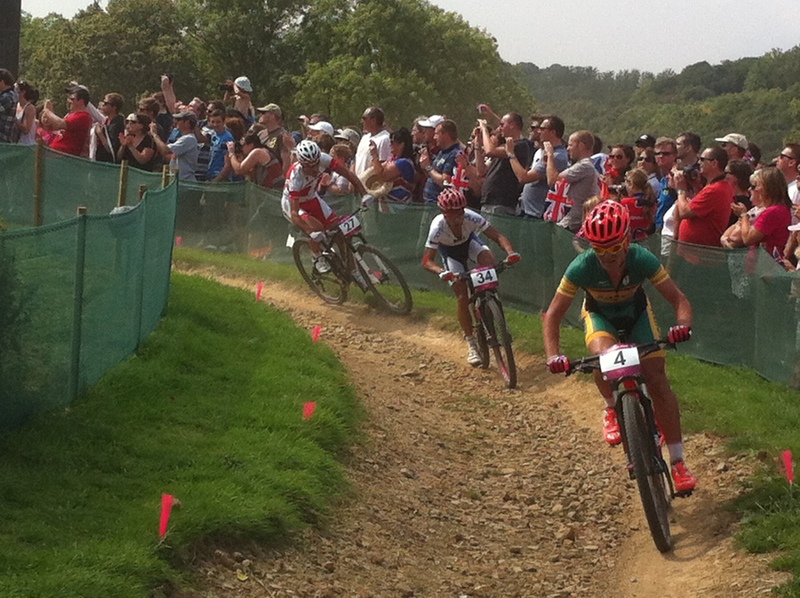 I was fortunate enough to see the start of the women’s race on Saturday. Standing at the top of the venue afforded me a great view of the 21,000 people there and the superb course and made me feel incredibly proud to be British. I had been a small part of our fantastic Olympic adventure with an experience I will never forget. Caveat emptor roughly translated means ‘buyer beware’, a rather important principle that you alone are responsible for checking the quality and suitability of goods before you buy them. But there are riders to this, especially when buying from a business, online (distance selling regulations) or otherwise. If you buy a secondhand car from a dealer and a fault develops, what happens depends on when the fault is found. If it’s within six months of the purchase, the onus is on the dealer to show that the fault definitely wasn’t there when you bought it. If it’s after six months, the onus is on you to prove that the fault was there when you bought it. The timing issue makes a huge difference. These consumer rights fall under the Sale of Goods Act 1979 and the Supply of Goods and Services Act 1982. I bought a Mondeo Estate in March 2011 from a west London dealer. Within four weeks the car had broken down on the M11 with an empty radiator. Where had the water gone? Through cracks in the cylinder head, the upper part of the engine. The service book had the details of the garage that had maintained the car for some years. A phone call confirmed my fears: the car had had the same problem just three months before and while the garage had attempted to rectify the fault, they had clearly failed. The dealer I bought the car from had purchased it from an auction – tough luck for them. Caveat Emptor. I had evidence that the fault had pre-existed my purchase – good luck for me. Or possibly not. After a heated argument with the owner along the lines of “the car was fine when you bought it”, he finally agreed to let his local mechanic have a look at it. I went on holiday for a week and came back to find the engine had been changed without my knowledge or permission. I was gobsmacked! I had no idea how many miles were on the ‘new’ engine and which of the peripheral parts had been re-used from my car or replaced. Even worse, the mechanic refused to give me any information as my contract was with the dealer not him. During the six weeks that followed, almost everything that could go wrong did. My local garage found that the engine hadn’t been fitted properly and had to rectify this. The air-conditioner didn’t work (it had previously) because it had been incorrectly refitted. The damage required a replacement. The turbo failed and had to be replaced. Various other bits also had to be replaced. I ran up many hundreds of pounds worth of bills. Each time a fault occurred, I contacted the dealer. He refused to return my calls. A number of ‘without prejudice’ letters flew back and forth. In the end, I decided I either had to let it go or take action in the county court. I chose the latter (and if you know me you’ll hardly be surprised at this!). Anyone who has ever been to court will know how long it takes to put the evidence together. In triplicate. Plus statements from expert witnesses. In triplicate. And photos of all the problems. In triplicate. A pain (in triplicate!) but I went through the process. A week before the court case, I checked the dealer’s website. The company name had changed. So had the manager’s. I drove to the garage and spoke to the new owner. He’d bought the garage a month before. All the staff had changed too. At home, I checked the Companies House website to find that the original company was up for dissolution. No paperwork had been filed for 12 months. Once dissolution happened, I could kiss goodbye to any chance of getting money from them. I contacted the relevant person at Companies House and they agreed to suspend dissolution for three months. I went to court. The other side didn’t turn up. The judge heard the case in their absence and found in my favour. I waited two weeks for payment to arrive. Nothing. At this point I was at a crossroads. What to do? Send in the bailiffs? Pretty pointless for while I had the director’s home address there was little chance of anything there being owned by the company. Put it in the hands of a no-win, no-fee debt collection agency? Possibly – but they’d have taken 30 per cent of the claim and I wasn’t confident they’d get a result. If someone owes you money and refuses to pay, you can issue an Order to attend court for questioning. At such a meeting, the court ascertains a person’s ability to pay. If that person is a company director, they have to produce all bills, invoices, balance sheets, profit/loss account and management accounts for the previous two years. Given that no paperwork had been filed at Companies House, I figured that the director wouldn’t like this move. A failure on his part to attend or to furnish the relevant documents would be treated as contempt of court and make him likely to be imprisoned. Ouch! So I filed the order. I had to get Companies House to suspend dissolution for an extra month but they were happy to oblige. Almost two months went by. Then 10 days before the hearing, I received a phone call from the director. A director in somewhat of a panic. A director who really didn’t want to attend court. A director who wanted to pay me in full.